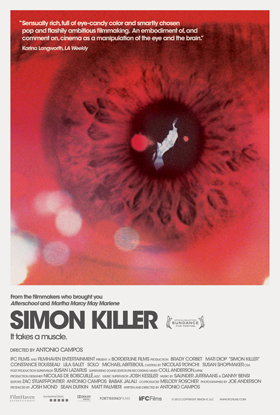 In light of the film opening this weekend, I thought that I would remind you that we have an interview with Antonio Campos (director) and Coll Anderson (sound designer) about the sound of Simon Killer. It was originally posted about a year ago; shortly after they completed final mix of the film. Maybe that gives you a bit of an idea of what life is like for an indie film. Designing Sound: So, you guys are working on Simon Killer…you’re wrapping it up today. Coll Anderson: Yeah. This is our last day. DS: It’s going to print. CA: Yeah. As soon as everyone leaves, I’ll probably re-bus…we have one line of dialog to see if we can get. It’s always a little game of inches at this point. All of the changes that we’re making are very, very, minor…just changes that sort of hyper focus the mood and flow. So, we have one line that we’re trying to get another inch or two out of, and then that’s it. Re-bus the console and hit record.